The Rabbi Wore Bell-bottoms is a “novoir,” part novel, part memoir. I was Jewish chaplain’s assistant at Fort Leonard Wood, Missouri, in 1970-71 and took extensive notes with the thought that someday they might generate a book. That day arrived. While the major plot developments are a product of my imagination, most of the anecdotal material is a product of those notes. I have also written a novella, Doglegs, dedicated to the proposition that dogs have it all over humans. Professor Emeritus at SCAD (Savannah College of Art and Design) I taught causes in advertising copywriting, served as advisor to three 1st-place teams in the National Student Advertising Competition-District 7, and was selected Educator of the Year by that district. Prior to teaching, I ran The Art of Copy, writing ads, videos, and speeches for a wide variety of clients. As creative director or copywriter at advertising agencies in Minneapolis, Chicago, and Boston, my credentials include an Emmy, a One Show pencil, and publication in the annual advertising edition of Communication Arts. If you guessed from the title, The Rabbi Wore Bell-bottoms, that this “novel memoir”, as it’s been categorized by author Art Novak, is going to be a fun read, you are right. It’s fun, yes, but it’s also uniquely serious, and as such will have you thinking as much as laughing…a winning combination for readers looking for something different. But to completely enjoy The Rabbi Wore Bell-bottoms, it helps to be able to think outside the box that organized religions put us into at birth i.e. most of us are born to parents who, unless they are atheists, follow a religion of some kind: Catholic, Lutheran, Christian, Muslim, Jewish, just to name a few. The narrator of this semi-memoir is Dan Berman, a Jewish member of the military who, hoping to avoid being sent to fight in Vietnam, has the good fortune to find himself assistant to the Jewish chaplain, Rabbi Weisberg, at Fort Leonard Wood in Missouri. Stephen is not that much older than Dan and, you guessed it, he’s decidedly non-traditional. After all, he wears bell-bottoms! Dan and Stephen hit it off from the word go and together they make the Jewish center at Fort Leonard Wood a super friendly community where the Jewish GIs can follow the dictates of traditional Jewish cuisine. Feasts of bagels with lox, corned beef and more are frequent and popular, much to the envy perhaps of other denominations who have chapels for worship but nothing comparable to a friendly community center. As the story progresses, that factor becomes a contentious issue that nearly sees the Jewish center closed down. Complicating Dan’s life even more is his falling in love with Harriet, the daughter of the God-fearing Lutheran chaplain, who is also the Fort’s main chaplain. When Harriet’s father discovers the couple sharing a bed at the Jewish community center, all hell breaks loose. If Dan and Harriet didn’t already have enough reason to question just what organized religion should be doing for mankind, why there are so many religions, each claiming to be the one and only, and why wherever there is religion there is fighting, even war, they question it now. Dan and Harriet reflect, discuss, and reach this conclusion: organized religion shouldn’t be about keeping followers through fear of hell, but should “maximize the joy in life and minimize the pain.” As the author points out, nature has natural ways of “aiding and abetting racial and ethnic bigotry” by giving races different identifying characteristics…shape of eye, size of nose, colour of skin…but “in the case of religious bigotry, man alone shoulders the blame.” Sadly, how very true. As mentioned above, The Rabbi Wore Bell-bottoms makes open-minded readers smile, often laugh out loud, but at the same time this novel memoir makes them reflect and think. Let’s face it: organized religions dictate our thinking and habits from a very early age but many people, as they mature, question much of what was drummed into our heads as children. 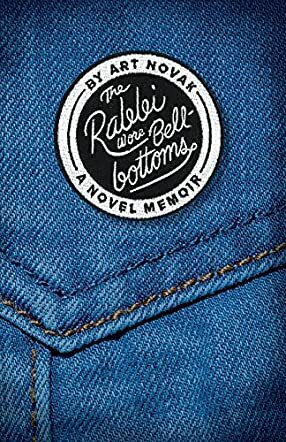 Through The Rabbi Wore Bell-bottoms, Art Novak invites readers to explore the questions so many of us have about whatever religion we were born into…and makes us feel okay with the conclusions we draw. Five stars from this reviewer! The Rabbi Wore Bell-bottoms: A Novel Memoir is a realistic fiction novel written by Art Novak. Dan Berman wasn’t quite sure how he ended up on the army bus filled with hapless recruits headed for Fort Leonard Wood, Missouri. He had done well in college and had been blissfully unaware of the social activists’ protests on campus -- except, that is, to have written a letter to the school paper protesting the protests. During his tenure in grad school, he had become marginally more socially conscious, which was good, but he had failed to take the right steps to adequately protect himself from the draft, which was bad. His only hope for a stateside stint, or at least one that didn’t entail going to Vietnam, lay with a connected uncle who was trying to get him into the Information Service. Dan could definitely get into the idea of writing for Stars and Stripes. At the induction center, he had narrowly avoided being transferred into the Marines, but would that Information Service gig come through? What he actually did end up getting was an assignment being a Jewish Chaplain’s Assistant. While he was Jewish and had spent long years going to Hebrew School, Dan wasn’t particularly religious, but then again Captain (Rabbi) Steven Weisberg was quite unlike any rabbi Dan had encountered before. The Rabbi Wore Bell-bottoms takes a hard look at organized religion while following the relationship of a wise and funny rabbi and the unlikely assistant the army provides him. Most of the action in this Vietnam War novel takes place not in the jungles of Vietnam but rather in the Fort Leonard Wood Jewish Center, where the rabbi defines his own role in the entire ungodly affair by providing Jewish recruits, and anyone else who needs it, a safe place, a place that felt like home, complete with corned beef and pastrami on Saturdays and Nova lox and cream cheese on Sundays. I soon felt quite at ease in the Center as I witnessed what religion at its best could do, even as I salivated over the thought of those corned beef sandwiches. I’ll freely confess to having a dozen bagels in my refrigerator as well as Nova lox and cream cheese, so I was able to partake rather more, I suspect, than many readers in the rituals that made the Center feel so much like home. Novak has a lot to say about religion, faith and the belief in a higher divinity in this book which recreates so very well the chaos of the Vietnam years. He tackles conversion, interfaith marriages, even the use of the term “shiksa” when discussing a non-Jewish girl. His characters are thoughtful, intelligent and infinitely human. I was both perplexed and enthusiastic as Dan and Harriet navigate their way through the thornier aspects of interfaith relationships, and I loved watching as Stephen became Dan’s mentor and friend. This is also a coming of age novel that works so very well. While the war is ever-present, especially when those on the base have interactions with the wounded, there’s a special sense of the world that is the Jewish Center. And if there is a Rabbi Weisberg out there somewhere, I’d certainly like to become part of his congregation. The Rabbi Wore Bell-bottoms: A Novel Memoir is most highly recommended. The Rabbi Wore Bell-bottoms, part novel, part memoir, is a delightful story vividly relaying the life of a rabbi’s assistant during the political unrest of the Vietnam conflict. As his friends and colleagues successfully avoid the draft, Daniel finds himself in the position of full-time substitute teacher, content with remaining state side and dodging immersion into military life. Until that fateful day when the US postal service delivers the inevitable notice that he, too, will join the rank and file. Although he manages to sidestep the Marines in lieu of the army, Daniel enlists as a Jewish chaplain’s assistant, working and living in the Jewish Religious Center under Rabbi Stephen Weisberg.